While everyday life can be stressful enough for persons with communication disorders, the holidays can add another layer of complication. With holiday parties and visits from family, there is no shortage of background noise from music and loud conversations, as well as pressure from others wanting to communicate. People with speaking challenges can still enjoy the holidays with the help of a few minutes of meditation each day. Caregivers and Individuals with Aphasia Benefit: Practicing mindfulness and mediation has been shown to change the structure of the brain. Accepting thoughts as they come rather than trying to change them is beneficial for any individual, but especially someone recovering from a brain injury. Following our guided meditation (we used a platform called Headspace), our group members - both with aphasia and without aphasia - reported less stress and a more "open" mind. We've now completed three guided meditations as a group! Research Supports Meditation: Research shows that two of the four areas of the pre-frontal cortex (the “thinking” part of the brain behind the forehead) thicken and strengthen when you meditate. Meditation also calms the mind, which helps with brain-training exercises. According to a recent Washington Post article, "Long-term meditators have an increased amount of gray matter in the insula and sensory regions, the auditory and sensory cortex." In laymen's terms: when you practice meditation, you're more mindful, which ultimately helps enhance your senses. 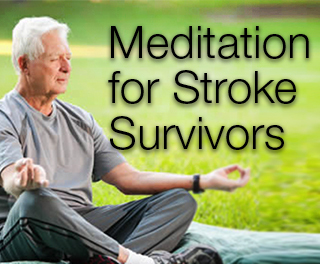 It's a New Skill: Learning and practicing meditation is especially helpful for individuals with brain injuries because it challenges their brains, by not only keeping existing neurons strong but also adding new neurological connections. Lowers Stress Levels: People who meditate regularly have stronger immune systems and report less emotional distress. A University of Wisconsin study saw increased electrical activity in regions of the left frontal lobe, an area that tends to be more active in optimistic people, after eight weeks of training in meditation. Helps With Other Health Ailments: Our users approached mediation with the goal of reducing stress, but research shows meditation can benefit individuals with a variety of ailments including as anxiety, diabetes, cancer, back spasms, insomnia, or depression. If you're ready to try meditation, we listed some very helpful resources below. Our User Group recommends practicing every day at the same time and in the same place. Don't forget to tell us what you experience.